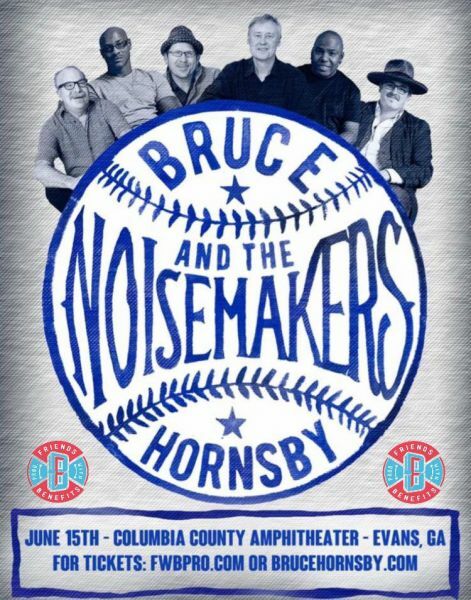 Bruce Hornsby & The Noisemakers coming to Columbia County Amphitheater June 15 in Evans, GA! 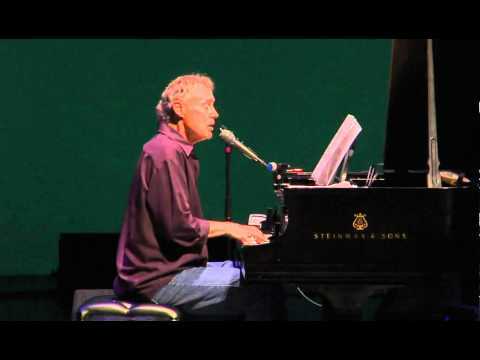 Come witness the legendary Bruce Hornsby! Bruce Hornsby has built one of the most diverse, collaborative and adventurous careers in contemporary music. Drawing from a vast wellspring of American musical traditions, the singer/pianist/composer/bandleader has created a large and accomplished body of work and employed a vast array of stylistic approaches. Throughout this period, Hornsby has maintained the integrity, virtuosity and artistic curiosity that have been hallmarks of his work from the start. Hornsby and his band The Range's first album The Way It Is (1986) was steadily and slowly building in popularity in the U.S. when in August the title track exploded on BBC Radio One in England, then Europe, the rest of the world and finally in the United States. The record went on to sell three million records, the band played Saturday Night Live and opened for Steve Winwood, John Fogerty, Huey Lewis, the Grateful Dead and the Eurythmics before becoming headliners on their own tour supported by Crowded House. Soon Hornsby was being approached regularly to collaborate with a broad range of musicians and writers, a demand that continues to this day. He has played on records for Bob Dylan, Robbie Robertson, Bonnie Raitt (piano on her iconic "I Can't Make You Love Me"), Willie Nelson, Don Henley, Bob Seger, Squeeze, Stevie Nicks, Chaka Khan, Charlie Haden, Jack DeJohnette, Crosby, Stills and Nash, Justin Vernon (of Bon Iver), Leon Russell, Chris Whitley, Warren Zevon, Bernie Taupin, Brandon Flowers (of the Killers), Cowboy Junkies, Shawn Colvin, Bela Fleck, Randy Scruggs, Hillary Scott, the Wild Magnolias, Clint Black, Sara Evans, Clannad and many more. He has worked on his own records with Ornette Coleman, Jerry Garcia, Eric Clapton, Sting, Elton John, Mavis Staples, Phil Collins, Pat Metheny, Branford Marsalis, Wayne Shorter and Justin Vernon, among others. Along with his early collaborator, brother Jonathan Hornsby and latter-day partner Chip deMatteo, Bruce has co-written songs with Robert Hunter (the great Grateful Dead lyricist), Robbie Robertson, Don Henley, Leon Russell, Charlie Haden, Chaka Khan, and Jack DeJohnette. His songs have been recorded by another broad array of artists including Tupac Shakur (his iconic "Changes"), Akon, E-40, Chaka Khan, Don Henley, Leon Russell, Willie Nelson, Mase, Randy Scruggs, and Robbie Robertson. Over the years Hornsby has successfully ventured into bluegrass, jazz, classical, and even electronica, reflected on acclaimed releases like two projects with Ricky Skaggs- Ricky Skaggs and Bruce Hornsby (2007) and the live Cluck Ol' Hen (2013), the jazz trio album Camp Meeting (2007) with Jack DeJohnette and Christian McBride, and Solo Concerts (2014), a stylistic merging of traditional American roots music and the dissonance and adventure of modern classical music. This latter-day interest has led to an orchestral project spearheaded by Michael Tilson Thomas featuring this new music; the first performance occurred in January 2015 with Tilson Thomas' New World Symphony. His three Grammy wins (along with his ten Grammy losses!) typify the diversity of his career: Best New Artist (1986) as leader of Bruce Hornsby and the Range, Best Bluegrass Recording (1989) for a version of his old Range hit "The Valley Road" that appeared on the Nitty Gritty Dirt Band's Will The Circle Be Unbroken Volume Two, and a shared award with Branford Marsalis in 1993 for Best Pop Instrumental for "Barcelona Mona", a song written and performed for the 1992 Olympic Games. The sales stats and breadth of his collaborations (including being sampled many times by rap/hip-hop artists) speak volumes about Hornsby's unique fusion of mainstream appeal and wild musical diversity. His albums have sold over eleven million copies worldwide. Harbor Lights (1993) won the Downbeat Reader's Poll Album of the Year in 1994. Tupac Shakur co-wrote a new song over "The Way It Is" music called "Changes"; it was a major worldwide hit in 1998, selling 15 million copies. In 2006 his 4 CD set Intersections was selected as one of the best boxed sets of the year by the New York Times. His song "Levitate" was selected in 2011 by Sports Illustrated as one of the top 40 sports songs of all time. 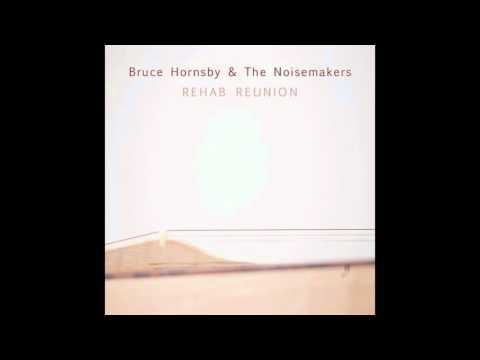 Bruce and his current band The Noisemakers' latest record ( a collection featuring Bruce on the Appalachian dulcimer) "Rehab Reunion" (2016) entered the Billboard album chart at 101, marking his tenth album appearance on the venerable chart over a thirty-year period. In 2016 the annual Rolling Stone "Hot List" selected Bruce as "Hot Surprise Influence", citing his influence and inspiration on such modern artists as Justin Vernon (Bon Iver) and Ryan Adams. Throughout the years Hornsby has participated in several memorable events: the Rock and Roll Hall of Fame opening concert in September 1995 (with the performance included on the concert album), Farm Aid IV and VI, the Telluride Bluegrass Festival (many times), the Newport Jazz Festival (2007), New Orleans Heritage and Jazz Festival (1997 and 2011), Woodstock II (1994), Woodstock III (1999, with the band's performance included on the concert album), and the Bonnaroo Festival (2011). Hornsby, solo and with Branford Marsalis, has performed the National Anthem for many major events including the NBA All-Star game, four NBA Finals, the 1997 World Series Game 5, the night Cal Ripken broke Lou Gehrig's all-time consecutive game streak, and the soundtrack to Baseball: A Film By Ken Burns. Bruce's long involvement with the Grateful Dead began when the group asked him to open two shows in Monterey, CA in the spring of 1987. Bruce and the Range continued to open shows for the Dead in 1988, 1989 and 1990, and after the tragic death of Dead keyboardist Brent Mydland the band asked him to play with them. He started winging it with them with no rehearsal for five nights at Madison Square Garden in September 1990,, and played more than 100 shows with them until March 1992. He continued to sit in with the band every year until Jerry Garcia passed away in 1995. He played in the first post-Dead band "The Other Ones" in 1998 (the album "The Strange Remain" chronicles that tour) and 2000. Bruce reunited with the band for the 50th Anniversary Fare Thee Well concerts in June and July 2015 at Levi's Stadium (Santa Clara,CA) and Soldier Field (Chicago). He appears on seven Grateful Dead records including "Infrared Roses" and "View From The Vault II". Bruce has been part of many tribute records including two Grateful Dead collections, the original Deadicated (1991) and the recent massive compilation curated by the band The National entitled Day of the Dead. He recorded "Black Muddy River" with Justin Vernon of Bon Iver and Justin's high school band DeYarmond Edison. Other tribute record appearances include Two Rooms- A Tribute To The Songs of Elton John and Bernie Taupin, a Keith Jarrett tribute, a tribute to The Band, a Fats Domino collection, Ricky Skaggs Big Mon- the music of Bill Monroe, and a Jackson Browne tribute record. A University of Miami alum, Hornsby has partnered with The Frost School of Music to establish the Creative American Music Program, a curriculum designed to develop the creative skills of talented young artist/songwriters by immersing them in diverse American folk, blues, and gospel traditions that form the foundations of modern American songwriting. Indeed, Bruce Hornsby's restless musical spirit continues to spontaneously push him forward into exciting new musical pursuits. He's composed and performed for many projects with long-time collaborator, filmmaker Spike Lee including end-title songs for two films, Clockers (1995, with Chaka Khan) and Bamboozled (2001). He contributed music for If God is Willin' And the Creek Don't Rise (2010), Old Boy (2013) and Chiraq (2015), and full film scores for Kobe Doin' Work, Lee's 2009 ESPN Kobe Bryant documentary, 2012's Red Hook Summer, Da Sweet Blood of Jesus (2015), and Lee's film for the NBA2K16 video game (2015). Bruce wrote and performed the end title song "Set Me In Motion" for Ron Howard's Backdraft (1991) and a featured song "Big Stick" for Ron Shelton's Tin Cup (1996). He's currently working with DeMatteo on a musical entitled SCKBSTD, and contributed music for Disney/Pixar's Planes: Fire And Rescue (2014). Hornsby is also featured onscreen in and contributed music to the Robin Williams/ Bobcat Goldthwaite film World's Greatest Dad (2009), the first (and last!) time he has been asked to "act." Three decades after Bruce Hornsby established his global name as the creator of pop hits that defined "the sound of grace on the radio," as a Rolling Stone reviewer once wrote, such projects continue and are consistent with his lifelong pursuit of musical transcendence. "It's always been about staying inspired, broadening my reach and range of abilities and influences, and exploring new areas", Hornsby says. "I'm very fortunate to be able to do that, to be a lifelong student, and to continue to pursue a wide-ranging musical life."